Kono has launched another mech board Kickstarter, for anyone who likes cool keyboards. This is a slim line bluetooth deal, can remember four devices, and all that. I’ve played with the prototypes, they are very cool. Comes in white or black, wired or wireless, low profile switches, and pretty colors, $99. 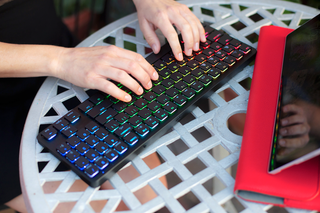 Meet the X-1 — a wireless, low profile mechanical keyboard that enables peak performance everywhere.